Click the below photo or the following link to try a month for $5! I recently held a giveaway on Instagram for my current obsession: Book of the Month. Each month, a panel of judges selects five of the best newly released books, and BOTM members choose which read(s) they want delivered to their door. The books are beautiful hardcover copies with specially designed covers, and they are always eye-catching. I couldn’t agree more. And that’s why I’m so excited to be a member. Available selections are announced on the first of each month, and members have six days to decide which book(s) they’d like to receive. All plans include one hardcover book of your choice each month plus free shipping. Members can purchase up to two additional books each month for $9.99 per title. You can skip the month as long as you do so within the six-day window, and you can cancel your membership at any time. Pricing tiers change depending on the length of membership you purchase. 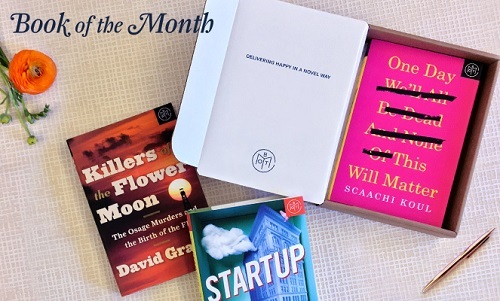 Visit Book of the Month for additional details, and use the link above to receive your first month for just $5!